Healthcare environments face a unique set of risks from the diverse and often stressed collection of people on site at any given time. 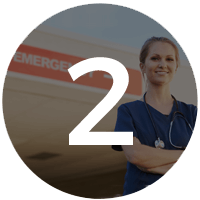 Safety officials within a healthcare facility must be prepared to manage this population in a variety of crisis situations, including violence that requires a lockdown, increased patient volumes resulting in elevated staffing requests, and large-scale community disasters. 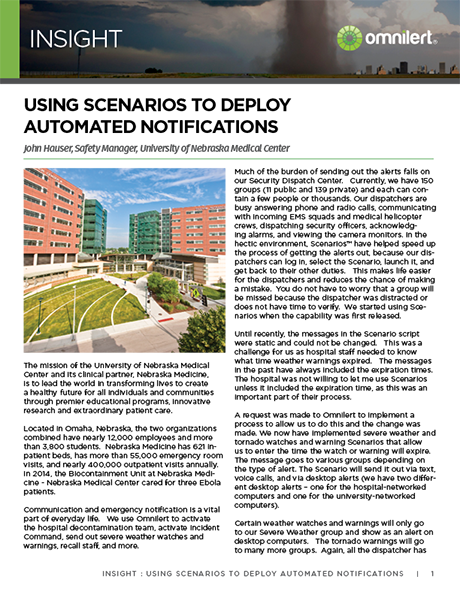 The responsibility demands a comprehensive, purpose-built, hospital alert system that removes the likelihood of human error and automates a rapid response to address operational goals. At healthcare facilities, crisis situations ranging from severe weather, community disasters, violence, and critical system failures. In a place where human life already hangs in the balance, it’s critical that these facilities have reliable emergency communication. In addition to affecting patient care, a slow or ineffective response can also result in regulatory penalties, financial losses, diminished reputation, and civil liability. The manner in which your facility responds to such events can have a profound effect on the outcome—and on you, personally. 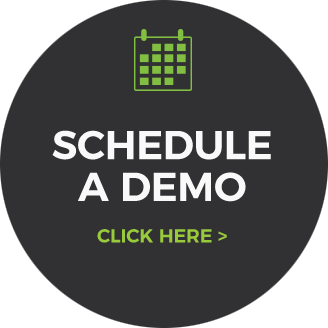 Whether it be severe weather alerts sent to employees or mandated notifications communicated to your surrounding community, the environment is one reason why healthcare facilities implement an emergency notification system and preparedness program. Healthcare facilities are at the core of our communities’ disaster recovery plans and must be prepared. 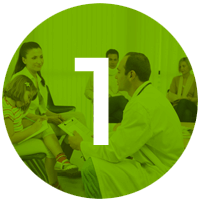 In addition, hospitals and clinics have compliance and regulatory requirements, as well as a general duty to provide a safe working environment. You can automatically initiate Omnimodal Notifications using predefined Scenarios in order to protect the people in your care. Although you can’t always predict or prevent threats and violent acts made by employees, visitors, patients, or strangers on your facility property, you can plan to limit the impact. By sending Omnimodal Notifications in a timely manner, along with the associated procedures, you can be better prepared and limit the potential impact of violence. 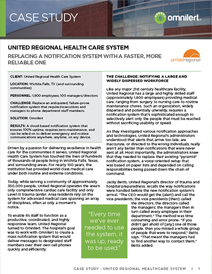 Power and network outages and technical failures can all hinder hospital operations. 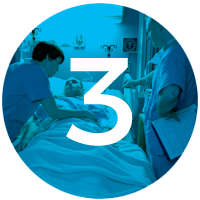 When it comes to mission-critical systems, downtime can impact patient care. You can resolve these threats to your infrastructure more quickly by automatically connecting your systems to your emergency notification initiatives. Your team will gain valuable time by being alerted immediately when your systems go amiss.